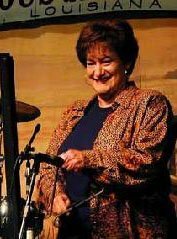 Nelda Balfa, daughter of Dewey Balfa, the Renowned fiddle player who helped Cajuns regain pride in their heritage, often listened to her father's music on her way to work. She felt lucky to still be able to hear his voice which sometimes made her laugh and other times made her cry. The power of her father's spirit came to her in a sound, a single note and then the words: "Pop tu me parles toujours" (Oh Dad you still speak to me). This became the genesis of the group "Balfa Toujours" which was originally composed of Nelda Balfa, Christine Balfa, Kevin Wimmer, Dirk Powell and Peter Schwarz.